I was immensely pleased when I noticed that THE BELLRAYS would play a show in my hometown Oberhausen. Firstly, because I'm a huge fan of California's finest purveyors of soulful hard-egded rock 'n' roll and also because good shows are rare in Oberhausen. At least, with regard to my musical taste. For this reasons, there was an attendance requirement for me. In addition, I missed the acoustic show of singer Lisa Kekaula and her husband Bob Venuum a few weeks ago at the same venue what still annoys me like a splinter in the finger. When I arrived a lot of people were already there and it was nice to meet old friends again. After a few beers and a couple of conversations, the opening act Pascal Briggs entered the stage with just one acoustic guitar. I remembered that a good friend of mine once was playing a record of Briggs' own band, The Stokers, that I liked and one track in particular. To be honest, I have to say that I would have wished to see The Stokers that evening, because his solo material didn't make me very happy. It reminds me of bands such as The Pogues and stuff like that, but only as an acoustic version. I find this kind of Celtic punk, or whatever you call it, quite unbearable due to its lager-swilling mood. So I left the hall and preferred to drink another cold beer outside instead of listening to Pascal Briggs. Then the time came at last and THE BELLRAYS set the scene for an electrifying. sweat-soaked rock show - very much in the tradition of MC5 or Sonic's Rendezvous Band without imitating these glorious bands. 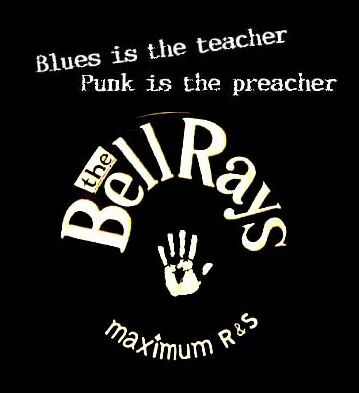 THE BELLRAYS are mostly located in the here and now what makes them so timeless and classic. But the initiate will know that Lisa replaced MC5 vocalist Rob Tyner on the last DTK/MC5 tour and there could not have been a more than worthy representative than her. And on this evening too, Lisa proved once again that she's a hell of a singer. Regardless whether it's 1960's soul or high energy rock - Lisa Kekaula rules the powers of the rock 'n' roll fire. To support this process, guitarist Bob Venuum unleashes a riff firestorm with his Gibson SG, backed up by a piston-precision rhythm section which drives all these loud, hook-laden songs. But one should bear in mind that THE BELLRAYS have actually been around since the 1990, and have gained a great deal of experience in the past 20 years. Unfortunately I don't have a setlist (I was busy with kickin' out the jams), but as far as I remember THE BELLRAYS played a lot of songs from their great 2011 album 'Black Lightning' such as 'Power To Burn', Living A Lie', 'Everybody Get Up' and 'Anymore'. But of course songs from older albums were also present as, for example, 'Voodoo Train' or a killer version of 'Sister Disaster'. Lisa Kekaula was truly eye-catching due to her strong charismatic personal presence and between songs she kept on emphasising that this is a 'Rock Show'. Well, I could not agree more even after two months. Near the end of the gig, she also went into the audience and sang from there what makes her all the more likeable. To conclude, there were three encores and THE BELLRAYS flared up again. They played for almost two hours and I can say with a clear conscience that many people I met shortly afterwards were really enthusiastic including myself. That was a great gig where THE BELLRAYS have managed for one night to transform Oberhausen into Detroit 'Motor City'. I am very grateful for that.